Gaurav Raina has emerged victorious in Event #29: $2,500 No-Limit Hold'em after winning the heads-up battle against James Calvo as the tournament continued through to an unscheduled Day 4. "We had a joke with my friends. I said I was going to win three bracelets this summer, and we were all laughing. None of us thought that anyone of us is actually gonna win a bracelet. But we were like 'we've been preppin', we're beasts.'" Raina now has accomplished one-third of his plan. "We're gonna go hard, it's gonna be awesome," he said. The interrupted heads-up match gave Raina an opportunity to rest and set up a game plan designed specifically for play against Calvo, who showed some unorthodox patterns during the duel. "I definitely spent some good time with friends discussing what the hell is this guy doing. I haven't seen many of his hands the entire day, the only hands he turned over were big hands, which is crazy, because his frequencies are super high," Raina said. "I was trying to figure out what his bet-sizing patterns were," he added. Knowing he was coming back with a shorter stack, Raina wanted to make sure he'd do absolutely everything to scoop the bracelet. "I couldn't sleep much. I was thinking about the chip disadvantage, the bracelet, the huge pay jump. I got like four hours of sleep and I was just like walking around in circles. Trying to figure out what to do to not lose this match." "It definitely couldn't hurt me to get rest and to come back. I was just amped up and wanted to finish, but other than that, it makes no real difference. It's a little suspenseful." It couldn't start much better for Raina as he doubled in the fifth hand of the day (146th of the final table) when his flopped two pairs held against Calvo's flush draw. Raina vaulted to a slight lead and the players then changed chips back and forth. Calvo, who took a lot of time to make every decision, was pulling out some big raises and check-raises to frustrate Raina. "Unfortunately, I never had a hand. I was airballing most of the time. His timing was very good. He managed to somehow check-raise when I didn't have much." Raina had to adjust to his opponent's style and tempo. "I started limping the button because I figured he would be bombing, making big three-bets. Eventually, when I do get the right hand, I need to not let him stop bluffing." Raina did eventually catch Calvo when he flopped a set of jacks, letting his opponent move all in on the turn where Raina's hand improved to a full house. Calvo still had a chance to win as he had queens up, hoping for another queen to land on the river. Raina faded the two-outer and then finally enjoyed the moment of joy after the 212th hand of the final table. Originally From New Jersey, Raina and his girlfriend are moving to San Diego after the summer. Until then, there are still plenty of bracelets to chase for the Event #29 champion. Hand #212: Gaurav Raina raised to 400,000 from the button and was called by James Calvo in the big blind. The flop came and Calvo checked. Raina bet out 400,000. Calvo then raised to 1,200,000. Raina called. 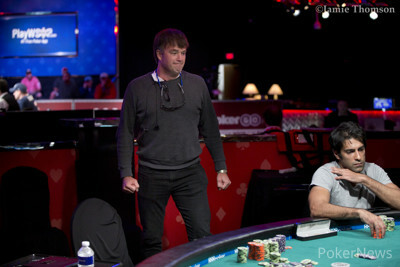 The turn brought the and Calvo paused for a moment, then announced all in for 3,700,000. Raina snap-called and jumped out of his seat. The cards were tabled and Raina had a commanding lead with a turned full house, leading Calvo's two-pair. "No queen," pleaded Raina's rail, as everyone watched in anticipation as the dealer paused to reveal the river card. The completed the board and Raina was crowned the champion as he jumped into his rail in celebration. Calvo would ultimately fall one place short of his first bracelet, collecting an impressive $282,276, for his second-place finish. Hand #207: Gaurav Raina received a walk in the big blind. Hand #208: Raina raised to 400,000 from the button before James Calvo bumped it up to 1,200,000 from the big blind. Raina mucked his hand and Calvo took down the pot. Hand #209: Calvo opened to 700,000 from the button and took down the blinds and antes after Raina mucked his hand. Hand #210: Raina raised to 400,000 from the button and was called by Calvo in the big blind. The flop came and Calvo bet out 700,000. Raina looked over Calvo's stack before announcing all in for over six million. Calvo mucked. Hand #211: Raina received another walk in the big blind. Hand #206: There were two minutes left in the level and the tournament supervisor informed players about an upcoming break. "Thank god, I'm so tired," said James Calvo in relief. Then the last hand before the break started as Gaurav Raina made it 320,000 to go and Calvo accepted. Calvo checked on the , letting Raina fire a 300,000 continuation bet. Calvo then cut out a pile of the most valuable chips and check-raised to 900,000. Raina called. The turn and river were checked through and Calvo revealed his for air on the flop and rivered pair. Raina had flopped a ten, and the eight also hit him. Despite four clubs on the board, Raina's for two pairs was good and he regained the lead before they headed for a 15-minute break. Hand #201: James Calvo was on the button and didn't realise the action was on him. "Oh, it's on me?" asked Calvo. "See! I don't even know that," he added. "I'm looking at you thinking it's up to you. That how tired I am." Calvo then bet 500,000 and took down the pot after Gaurav Raina mucked his hand. Hand #202: Raina raised to 320,000 from the button and took down the blinds and antes. Hand #203: Calvo opened to 500,000 which was too much for Raina as he mucked his hand. Hand #204: Raina put in his usual 320,000 raise from the button and won himself the pot after Calvo's cards went into the muck. Hand #205: Calvo thought for a moment, then bet 500,000 from the button. Raina immediately mucked and Calvo took down the pot. Hand #194: Gaurav Raina raised to 320,000 but James Calvo pumped it to 1,000,000, forcing Raina's fold. Hand #195: Calvo limped and Raina checked. Raina also checked on the flop and Calvo scooped the pot with his 500,000 bet. Hand #196: Calvo received a walk. Hand #197: Calvo returned the walk to Raina. Hand #198: Raina raised to 320,000 and Calvo mucked. Hand #199: Calvo opened to 500,000 and Raina folded. Hand #200: Raina won another pot uncontested, earning Calvo's big blind after min-raising. Hand #192: Gaurav Raina raised to 240,000 from the button. James Calvo then thought about his decision for several minutes. "Do you want this heads-up to take four days?" asked Raina, showing signs of frustration. "I'm trying the best I can," responded Calvo. "I'm not in my 20's. I'm 51," he added. Raina then called time and Calvo was given 30 seconds to act. "I'm tired. I can't count the chips that quick," said Calvo to himself. "I'm just trying to enjoy myself," he added, before making the call. The flop came and Calvo checked. Raina bet 300,000. Calvo called shortly after. The turn brought the . Calvo checked, then mucked his hand after Raina slid out 900,000. Hand #194: Calvo called from the button and Raina checked his option. The turn brought the and Raina tossed out 225,000. Calvo mucked. 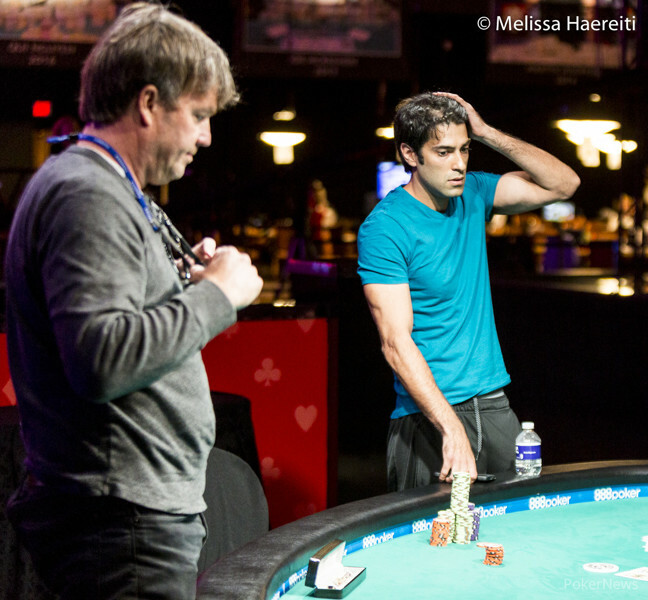 Hand 187: A raise-and-take for James Calvo who made it 500,000 from the button. 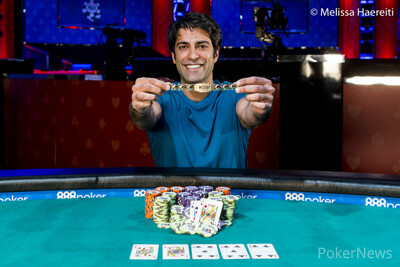 Hand 188: Gaurav Raina raised to 320,000 and Calvo three-bet. "How much is it this time?" Raina asked with a smile on his face, and the dealer confirmed it was one million. Raina folded. Hand 189: Raina got a walk. Hand 190: Raina raised to 320,000 and Calvo matched the price. They checked the but Calvo check-folded to Raina's 300,000 bet on the turn. Hand 191: Calvo limped but Raina raised to 500,000. Calvo called. The flop saw Raina continue for 550,000 but Calvo cut out chips for a raise and eventually slid forward 1,500,000. "I really don't know how this is possible. This is insane," Raina said to his railbirds, showing frustration.